On my amazon shopping cart, the Corioliss Curling Iron wand has been waiting a couple of weeks to be purchased. It might just be waiting a while longer, because while watching TV a commercial came on promoting an identical product for half the price. 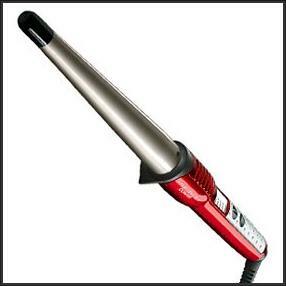 The Infiniti Curling Wand Styler by Conair ($35) can be found at beauty supply stores like Ulta. The Corioliss wand ranges from $60-$100 depending on size of the barrel. Being the product junkie that I am, I went to Ulta the following day and purchased the wand. It's not my favorite hair styling tool. The curling wand is basically a curling iron, without the annoying clamp getting in the way. What you get with the wand are tight, perfect curls. It's so simple, you just wrap your hair around it and curls form in seconds. You can also set the curler to your preferred temperature. In the end you'll have beautiful curls that will stay in place all day. The Many Do’s Of Kim K.